Annabeth is terrified. Just when she’s about to be reunited with Percy - after six months of being apart, thanks to Hera - it looks like Camp Jupiter is preparing for war. As Annabeth and her friends Jason, Piper, and Leo fly in on the Argo II, she can’t blame the Roman demigods for thinking the ship is a Greek weapon. With its steaming bronze dragon figurehead, Leo’s fantastical creation doesn’t appear friendly. Annabeth hopes that the sight of their praetor Jason on deck will reassure the Romans that the visitors from Camp Half-Blood are coming in peace. And that’s only one of her worries. In her pocket, Annabeth carries a gift from her mother that came with an unnerving command: Follow the Mark of Athena. Avenge me. Annabeth already feels weighed down by the prophecy that will send seven demigods on a quest to find - and close - the Doors of Death. What more does Athena want from her? Annabeth’s biggest fear, though, is that Percy might have changed. What if he’s now attached to Roman ways? Does he still need his old friends? As the daughter of the goddess of war and wisdom, Annabeth knows she was born to be a leader - but never again does she want to be without Seaweed Brain by her side. This is the third book in the Heroes of Olympus series by Riordan. As with all of Riordan’s book he follows his normal formula. The story is well done and entertaining; although with all the different characters we are following now things get a bit drawn out. I listened to this on audiobook and, like the previous two audiobooks in this series, this one was very well done. The narrator does a good job of keeping all of the voices straight...and there are a ton of voices to keep straight. Finally the two groups of Demi-gods meet. The meeting results in our group of heroes, basically the groups from the first two books, joining forces and journeying to Rome to confront some giants. Additionally Annabeth is told by her mother Athena to follow the Mark of Athena, which also takes them to Rome....but leads Annabeth on a solo quest. The fight against Gaia continues. Great continuation of this series. There is a lot of action and adventure and some great monsters just like in previous books. We even get to meet Hercules/Heracles. This story follows the same formula as previous ones...the heroes leave on a desperate quest to save the world, then find out they only have seven days to complete their mission. They fight monsters, journey, fight tougher monsters, journey, and then fight the big baddie at the end. The story gets a bit drawn out because it's following seven different characters and we hear from all of their different points of view. It's just a lot of characters to try and stay engaged with. It ends up making for a long story. The characters are pretty easy to distinguish between; Riordan has done a good job of giving them all outstanding characteristics. Despite the multitude of characters the story never gets confusing though and moves at a fast pace. The majority of the story is about these characters learning each others secrets and learning to trust each other. Of course they are also trying to prevent Gaia from ending the world. My favorite part was Annabeth’s solo quest to follow the Mark of Athena, I love her character and she confronts some truly creepy things. Overall I enjoyed this book and found it entertaining. These books are formulaic but also fast-paced and engaging. I look forward to the Doors of Hades when it comes out later this fall. Recommended to those who enjoy fantasy/adventure reads...or who have enjoyed previous Riordan books. I was looking for a good book to listen to while I work and I love Greek and Roman mythology so when I came across this I decided to try it out and I fell in love with the series. Also the performance is great. Rick Riordan did an amazing job with this book and I cannot wait to read or listen to the next one. I fell in love with the narrator... His multiple voices put a smile on my face many times. Great for a long commute! If you get stuck traveling, this is a great way to keep you content! Recommended! Would you listen to The Mark of Athena again? Why? No, I don't re-listen very often, and Riordan does a good job of making the marking events memorable especially as you read next entries into the series. Great historical tie-ins and doesn't give us the "lite" versions of mythology. The characters get to shine in seperate moments, allowing more of their personality to be revealed. I just wish I knew more about Jason! What about Joshua Swanson’s performance did you like? He keeps things moving and engaging, He has fun with the voices, even if they aren't all that dynamic (you can always tell it's Swanson, you never get the feeling he "transforms" into his characters) He make distinct differences between his characters (with maybe the exception of the giants, but that is understandable) Swanson also handles all the difficult names and locations which could easily get butchered. Simply because the book is relatively short, yes I would listen in one sitting. But the book isn't so engaging or edge-of-the-seat that I felt like I "couldn't put it down". As a series, the Heroes of Olympus is not as good as the original Percy Jackson and the Olympians, but is fun, and continues the stories of the main characters, and the story is good enough, you want to know what happens next. 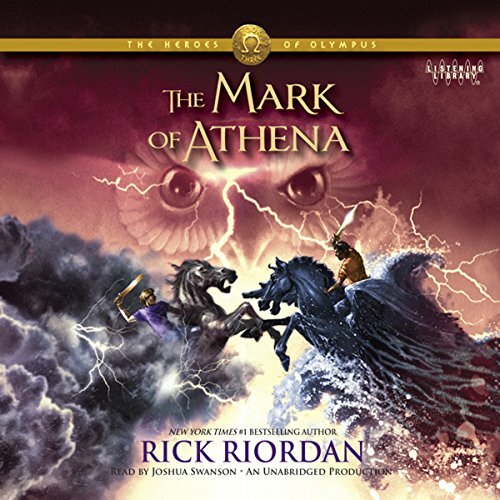 Would you consider the audio edition of The Mark of Athena to be better than the print version? Well, I enjoy reading the books on my own so the characters can develop and find a voice in my head on their own. I am not a fan of using someone else's thoughts to paint the characters for me..however, once I have read the book I thoroughly enjoy listening to the audio versions while driving and during my lunch breaks at work!! While the audio is wonderful I will always be a paper page reader first!! I am a huge fan of Percy of course!!! I am also coming around to Hazel. I love the life that he puts into his characters they are spot on, fantastic in my opinion. I was devastated when....sorry I don't do spoilers!!! Of course there were moments that moved me!! Love, love, love listening to this series as performed by Mr. Swanson!! I continue to find great joy in Rick Riordan's books. The Heroes of Olympus series builds significantly on his Percy Jackson and the Olympians series. In this third book, the demigods of Camp Halfblood must join forces with the demigods of Camp Jupiter on a world-wide quest. The Greeks and the Romans must work together, which is no small task as they were not even aware of each other! Moreover, an incident in the beginning of the book causes war to break out between the Greeks and Romans. Seven demigods (from both camps) are chosen for this quest: Percy, Annabeth, Jason, Piper, Frank, Hazel, and Leo. In this quest, the demigods work to fight the rise of Gaea and save Nico di Angelo. In addition, Annabeth must go on her own quest to follow the Mark of Athena in the hope of finding and saving the Athena Parthenos. It is believed that this statue will help bring peace to both the Greeks and Romans by uniting Athena with her Roman form, Minerva. There is a lot going on in this story, and it takes the characters all over the United States, across the Atlantic Ocean, through the Straits of Gibraltar, and on to Rome. In the past, I have frequently given Riordan's books five stars. I'm giving this one only four stars for one main reason: the number of characters is starting to get a bit challenging because its not always easy to remember who is Greek and who is Roman. In addition, the relationships between and among the demigods are becoming rather complex. The only way I could remember which demigod was which was by thinking about who he or she was dating--or not dating. In some ways, this caused the book to slip a bit into the teen romance genre, which is not what I enjoy about the series. While I understand it's a common part of growing up, I am hopeful that there will be just a bit less emphasis on it in subsequent books in the series. What made the experience of listening to The Mark of Athena the most enjoyable? As always, an interesting story with humor and mythology. I'm glad that Riordan has continued his mythology series, and has woven in characters from the original Camp Half Blood series into this new one. This was an interesting storyline, though I feel his best ones were found in the original Percy Jackson books. Certainly the Riordan mythology series work well as audiobooks -- the characters and humor translate well, and the reader did a good job with the different voices, and building excitement. That said, my personal preference is for the other narrators used on the Riordan books. No. But it was suspenseful. Neither my 10 year old son nor I have liked this series as much as the original Percy Jackson series or Riordan's Egyptian mythology series. Nonetheless, this installment was well done. My son wanted to zip through it. He keeps pestering me about the next one, so despite being a tad off from the Riordan highwater mark, it is still the most exciting series going to him. It took me two months, but I've finally finished it. I love the narrator, Joshua Swanson. His narration really brings the story to life and adds some extra humor. I'm very sad he didn't record the last two books in the series too.